‘For God is not unjust to forget your work and labour of love which you have shown toward His name, in that you have ministered to the saints, and do minister’ (Hebrews 6:10, NKJV). With the media buzzing with numerous stories about the heroic deeds of the medical teams and other first responders assisting in the aftermath of Hurricane Matthew, there is also another courageous person soaring behind the scenes to lend a helping hand. He fearlessly travels where most would turn around in dread. Nothing can stop him – not turbulent waters, not steep mountains, not even washed out bridges. No, it’s not a bird and it’s not a plane; it’s helicopter pilot Roy! Roy Harris, a Vietnam veteran of the U.S. Army and currently a first responder with Samaritan’s Purse, is flying relief missions with his aviation team in Haiti following the aftermath of Hurricane Matthew to deliver life-saving medical supplies, medical staff, and clean water in remote areas that have been passed over due to the high level of travel difficulty from washed out bridges and other impassable terrain. Roy is assisted by his co-pilot and son, Seth Harris, and Aviator Coordinator Donald Archibald. 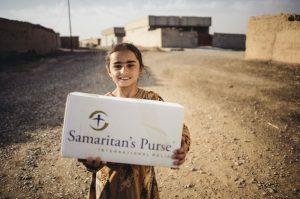 He has been flying helicopters since 1968 and came on board with Samaritan’s Purse in 1998. Countless lives have been helped because he dared to answer God’s great call on his life to care for the spiritual and physical needs of those less fortunate than him. I met Roy in October when he arrived in Haiti to aid in relief efforts following the devastation created by Hurricane Matthew. At 68, Roy walks briskly and purposefully with the agility of a man half his age. I asked Roy why he is still flying missions at an age when most are retired or considering retirement. One of Roy’s most recent assignments was to a small, remote village in Haiti called Rendell. This village’s only main bridge and connector to the rest of the world was washed out from the flooding and fierce winds caused by Hurricane Matthew. Consequently, the only remaining means of travel to the area was on the back of a slow-paced mule or a treacherous multi-hour hike. Thus, it was impossible to deliver medical equipment and other life-saving supplies to this group of people in a timely manner. SAMARITAN’S PURSE STAFF MEMBERS HIKE INTO RENDELL. THE HELICOPTER MADE GETTING STAFF AND SUPPLIES INTO THE REMOTE LOCATION MUCH EASIER. Roy and his helicopter team were able to complete tasks in minutes that would have otherwise taken days. Roy said that in some remote areas where he has been around the world, many people wouldn’t have survived without the helicopter. They would be too weak to travel for hours on foot or animal in areas where there were no infrastructures for vehicle movement. Minutes matter when dealing in life and death situations. Suzanne Jones, a nurse practitioner who works with the Samaritan’s Purse disaster assistance response team in Haiti following Hurricane Matthew, said that people who were near death and transported to their mobile clinic on stretchers were practically brought back to life with essential medical supplies such as IV fluids. Roy is indeed an example for all of us to follow. He is still making a difference after retirement age. He will always be a hero to those who have either met him, flown on his helicopter, or been restored by life-saving supplies flown in by him and his aviation team. Read more about our ongoing life-saving work in Haiti.